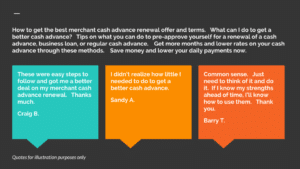 How to consolidate merchant cash advances. Many businesses have multiple mca merchant cash advances through stacking cash advances and are looking for major relief to lower their daily and weekly payments. A regular consolidation and reverse consolidation are ways to improve cash flow by as much as 25% to 50%. to what you are paying now. Research and contact companies that offer consolidation programs that match your business needs and daily budget. Review the qualification requirements and choose from programs that you have the best chance to qualify for. 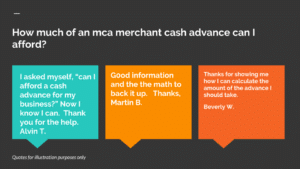 Do not get another mca merchant cash advance during the term of the consolidation. Complete secure Docusign 30 Second Application now. 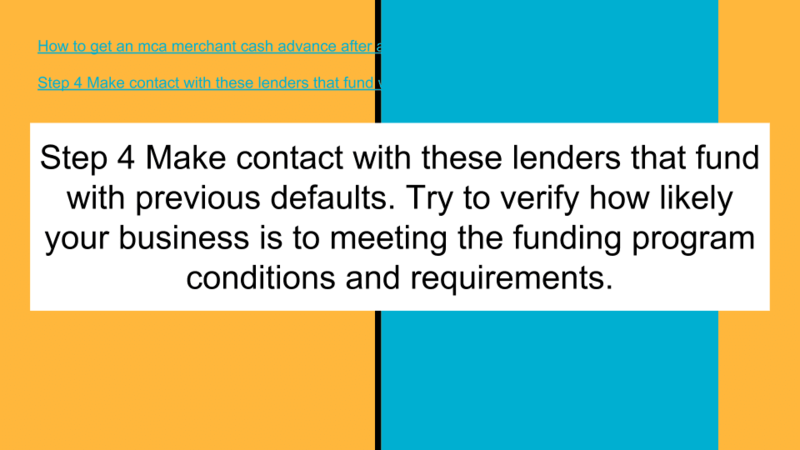 FAQ Frequently asked questions on merchant cash advance consolidation. 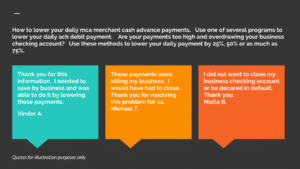 What is a merchant cash advance consolidation? I want a merchant cash advance consolidation. How do I qualify? Wait until 30 days after the most recent cash advance if possible before applying for a consolidation. 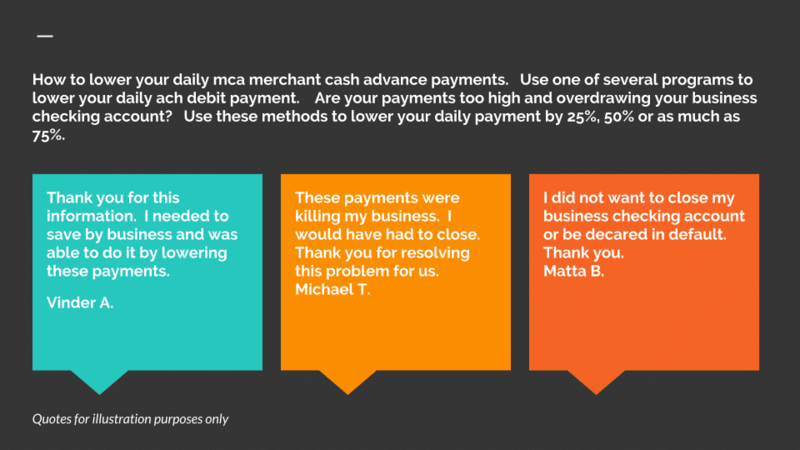 Most consolidation requests are declined if a business took out a cash advance in the last 30 days. Lenders want to see how a business is paying the most recent advance before a consolidation request is approved. 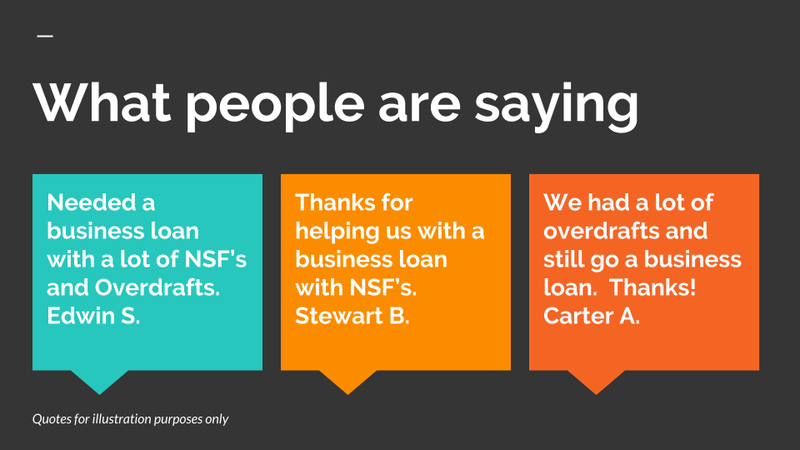 Your business should not have more than five overdrafts or five NSFs per month. Then complete the 30 second application above. 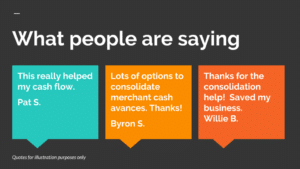 How can I get the best Merchant Cash Advance Consolidation? 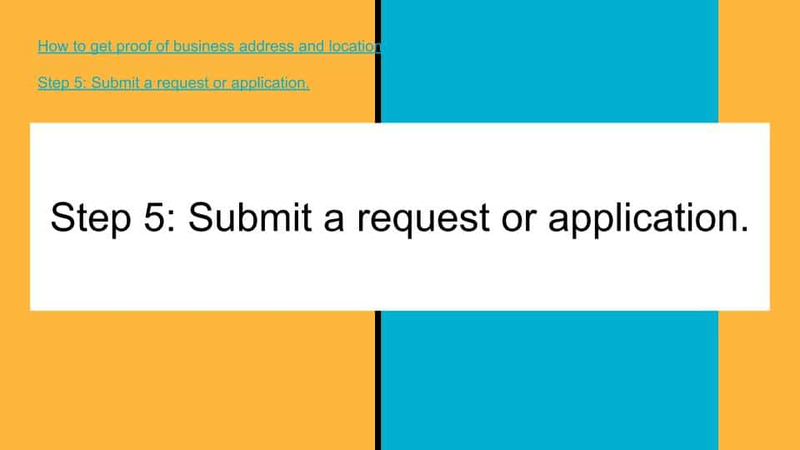 Complete the one page application. Provide information on the existing advances. Give the approximate balance and the daily payment. List how many months are left on the existing merchant cash advances. Determine how much per day, week and month your business can afford. A business may be able to cut their monthly payment up to 50% to 75%. 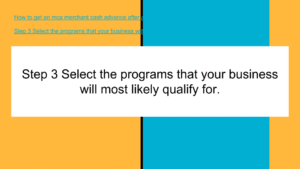 As an example a business has a $3000 monthly payment on two merchant cash advances combined. By paying those off with one 48 month loan, the payment can be cut as much as $1750 per month. By doing so the business now has an extra $1750 per month cash flow. It can use the savings for other business expenses. How much can I save per day or per week? In most cases, your business can lower payments between 25% and 50%. How does the consolidation work? 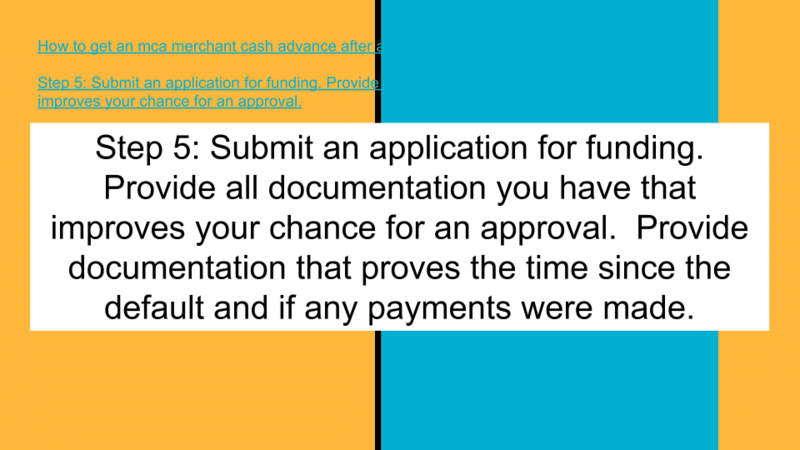 Your business submits an application and the most recent three months bank statements. Your business cash flow is analyzed to determine what your business can successfully pay in full. If it is determined that your business can pay a lower amount for a longer term, an offer may be made. Your current advances are either paid off or the daily payment is covered while you pay a much lower amount for a longer period of time. Do you offer reverse consolidations? h5>How does a reverse consolidation work? 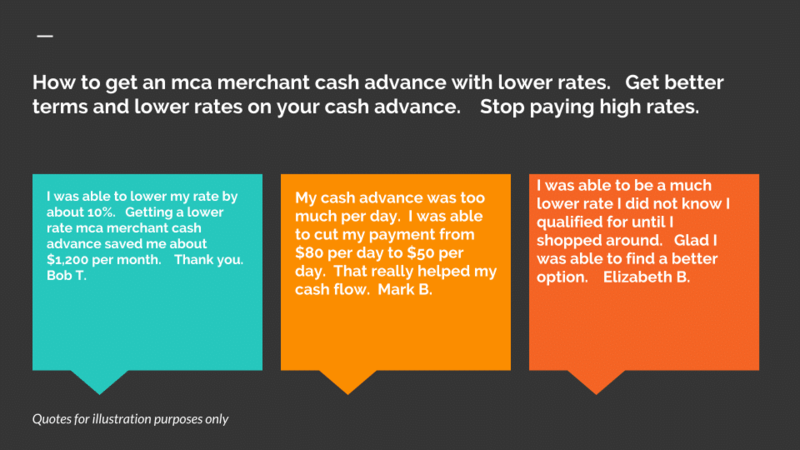 In a reverse consolidation, the current mca merchant cash advances are covered and paid on a weekly basis. An amount equal to one week of all mca payments are deposited into the business checking account of the merchant. The business then makes a reduced longer term daily payment to repay the reverse consolidation financing. The consolidation financing is for a longer term and often a lower rate than the merchants current mca advances. This allows the merchant to have a lower daily payment and improve their daily and weekly cash flow. Payments are often between 20% to 50% lower than their current advances. Can you consolidate business debt? You can consolidate business debt. There are several programs available to consolidate business debt. Other consolidation programs include consolidating merchant cash advances. Real Estate or other assets may be required to qualify for the consolidation of business debt. Some program options include a monthly payment and favorable early payoff options. Other features include higher consolidation approval amounts with high credit bureau scores or using real estate or other assets as collateral. 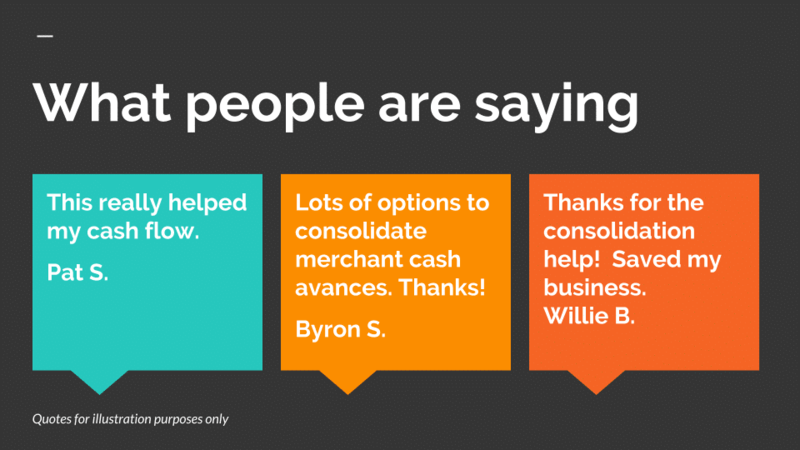 These businesses want to consolidate mca merchant cash advances, which consolidating an ach loan, or consolidating and ach business loan. 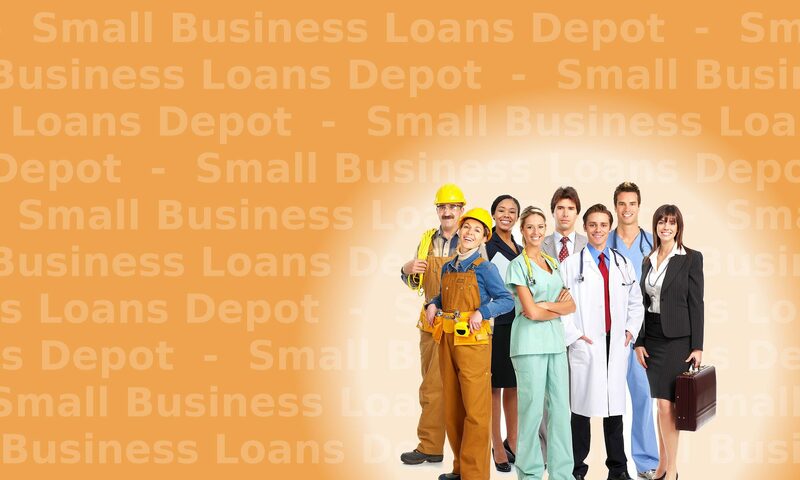 If your business does, it may be able to consolidate merchant cash advances into 1 loan. Your business may also be able to extend out the term of the advances. We can assist in paying off 2, 3 or 4 other advances and lowing your payment by as much as 50% or more. 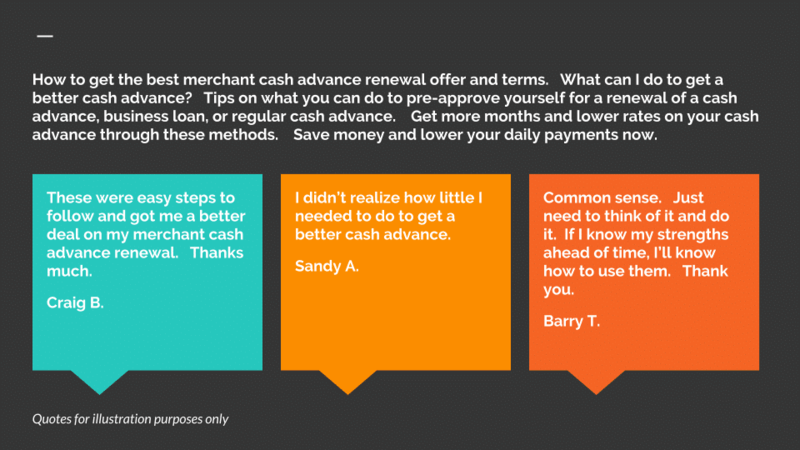 Some businesses have more than one merchant cash advance. Some businesses have 2, 3 or more short term advances. Due to the monthly cash flow impact, they cannot pay the advances and need cash flow relief. They need to either consolidate or extend the term. Consolidation and extending the term is an ideal solution. Funding can be advanced to allow your business to consolidate merchant cash advances into 1 loan. – Keep paying all your current advances on time before applying for a consolidation. 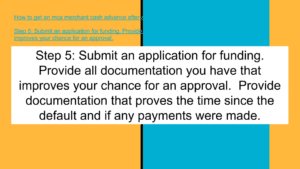 – Wait until 30 days after the most recent cash advance to apply for a consolidation. Most consolidation requests be declined if a business took out it’s most recent advance in the last 30 days. 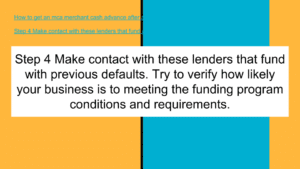 Lenders want to see how a business is paying it’s most recent debt before it agrees to approve a consolidation application. 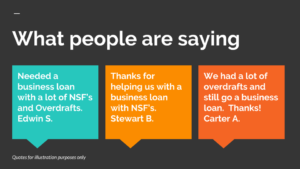 – Don’t have more than 5 overdrafts or 5 NSF’s per month. 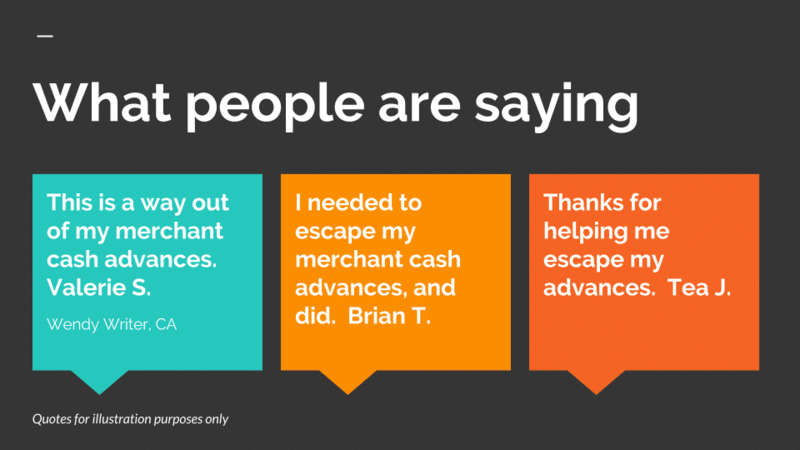 Consolidate your merchant cash advances today. – I need a mca merchant cash consolidation. 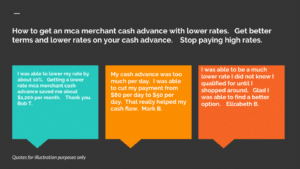 – Help me consolidate my mca merchant cash advances. – I need to lower my merchant cash advance daily debits. – Please help me save my business. My cash advances are suffocation my cash flow destroying my business. – No net funding requirement. – Any number of positions consolidated. There are daily, weekly, bi-weekly, and monthly repayment options for several consolidation options and loans. The repayment history on current advances. – If we are materially cheaper, and if your business has been able to pay your existing higher cost advances with minimal NSFs, we will aggressively pursue a consolidation. – Deposit volume and consistency are reviewed. If deposits vary significantly from month to month, we will typically look at the lowest month when calculating an amount to offer. Up to 1.25 times your deposits with a 6 to 12 month term are offered. – (NSF) insufficient funds and overdraft frequency are looked at. 1. Advances are available in almost all states EXCEPT California. Term loans are available. 2. Your future consolidation advance acts like more of a line of credit than a typical advance — a merchant can request additional capital at anytime from us. We will quickly re-underwrite it with no fee and offer additional funds and keep your scheduled payment the same. You do not have to pay off our advance with us in order to get more capital. This holds true if your business requests more capital after one month, or after six months. Your business saves money at renewal. Your business will not pay interest on interest if you renew for premium programs. – No origination or underwriting fees unless three or more advances are consolidated. Then those fees are still lower, $250 to consolidate 3 to 4 advances, $500 to $750 for 5 or more advances). No NSF fees or other junk fees are charged. – The maximum initial advance or loan is $100,000. – This is first position funding only. This funding can be the only funding following a consolidation. A standard line of credit, credit card split loan, traditional bank loan. 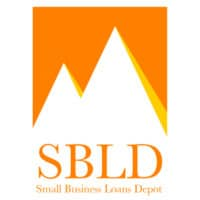 – SBA loan, car loan, student loans and home loans can be left in place. – Daily, weekly, bi-weekly, and monthly payment options are available. Your business may need help creating a business plan. The SBA can also assist with ideas and programs to develop a business plan.